Snag sweatshirts & hoodies from $12 while you're at it. View in web browser. ONLINE ONLY. TODAY ONLY, 8/30. 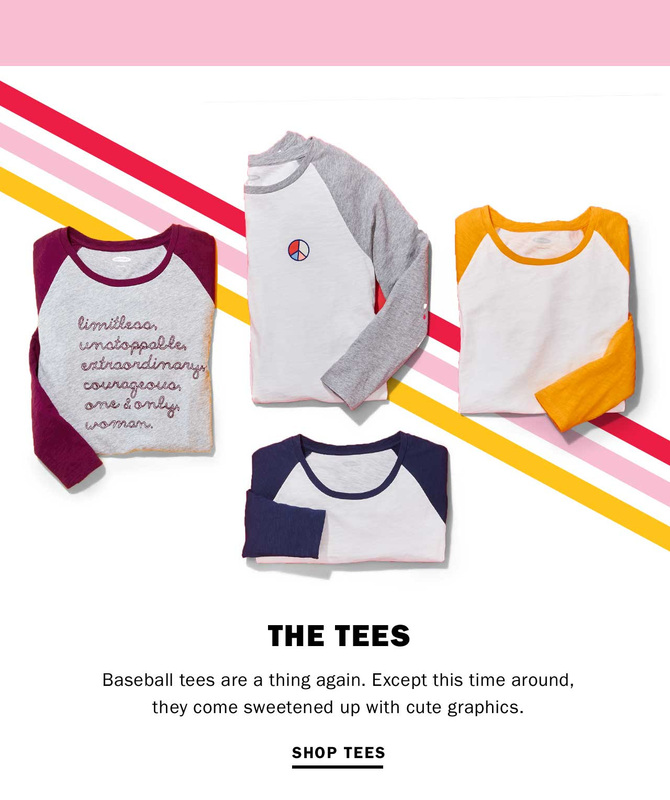 If you'd rather not receive email updates from Old Navy, you can unsubscribe from our mailing list by clicking "Unsubscribe" above. 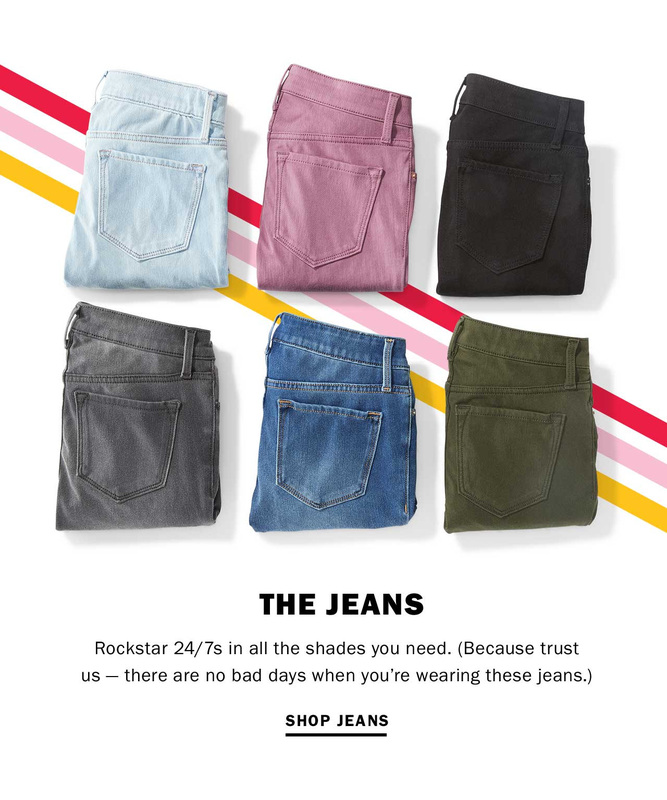 All Jeans, Tees, Sweatshirts & Dresses 50% Off: Select styles only. While supplies last. For a limited time. Online & in-store prices and exclusions may vary. Kids & Baby Sale. Up to 60% Off: Select styles only. While supplies last. For a limited time. Online & in-store prices and exclusions may vary. 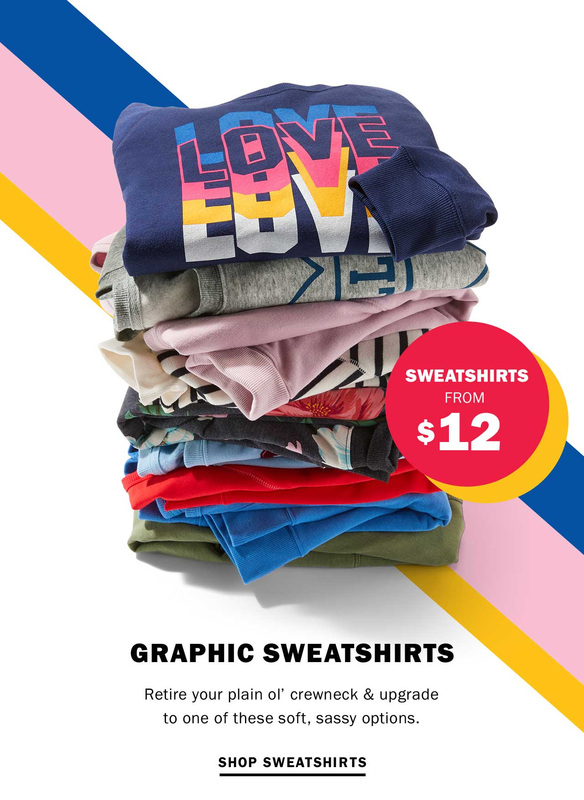 20% off: Offer valid on Old Navy merchandise only from 8/30/18 at 12:01 am ET through 8/30/18 at 11:59 pm ET in the US (including Puerto Rico) at Old Navy online at oldnavy.gap.com. Not valid at Old Navy stores. Offer not valid on Today Only Deal, 2 Days Only Deal, Hot Deal, Hi, I'm New, Best Seller, Licensed Product, Jewelry, and Beauty merchandise. Not valid on international purchases. Discount applies to merchandise only, not value of gift cards purchased, packaging, applicable taxes or shipping & handling charges. No adjustments on previous purchases. Not valid for cash or cash equivalent. 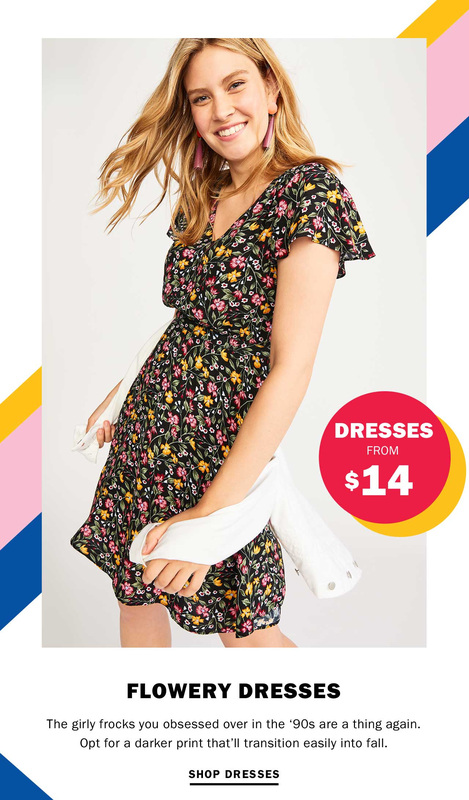 Cannot be combined with other offers or discounts including Gap Inc. employee discount. 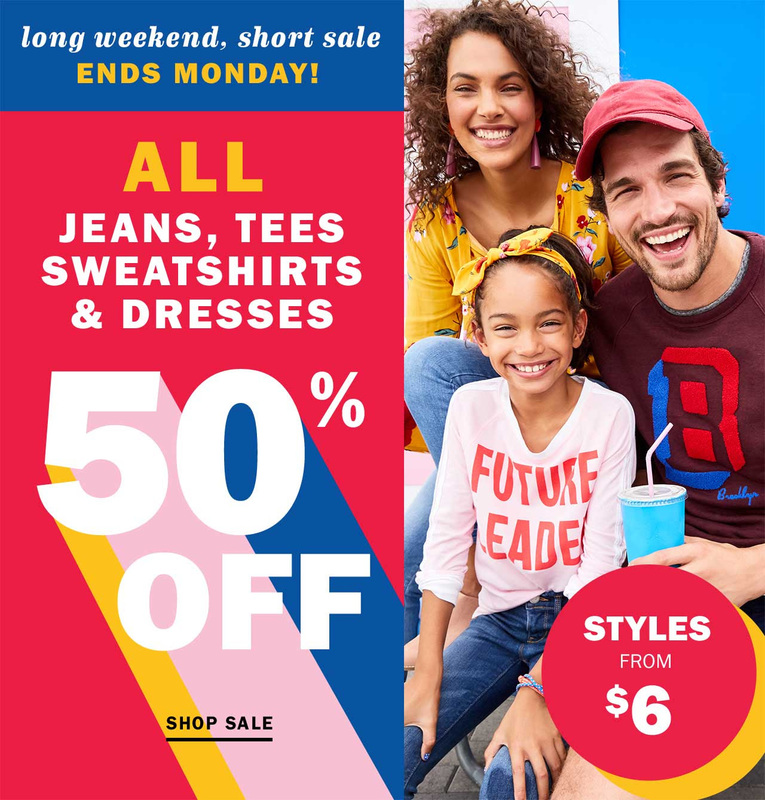 Gap Inc. is not responsible for lost or stolen coupons. *25% Discount: Subject to credit approval. A Gap Inc. credit card must be used as payment type. 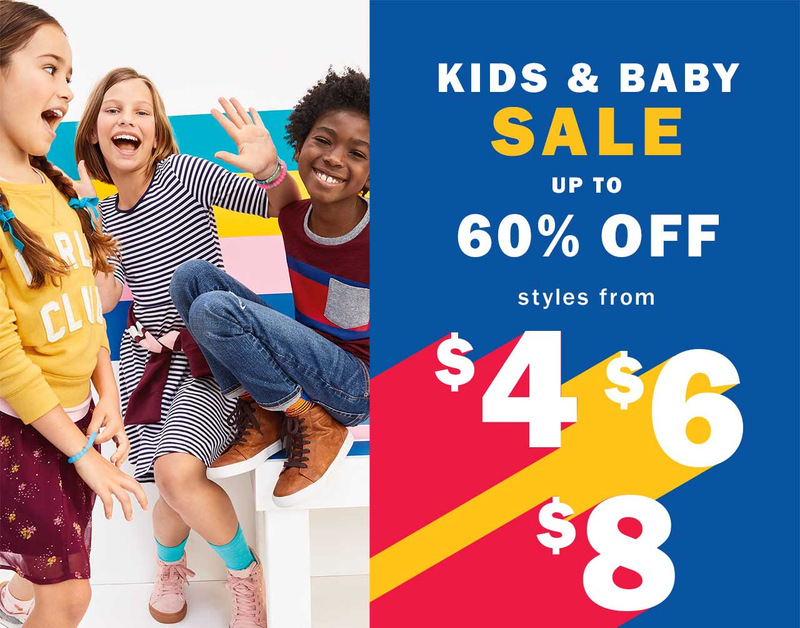 A new cardmember who opens an Old Navy credit card or Visa account online will receive a 25% off discount code valid for one time use online at OldNavy.com in the U.S. (including Puerto Rico) only. 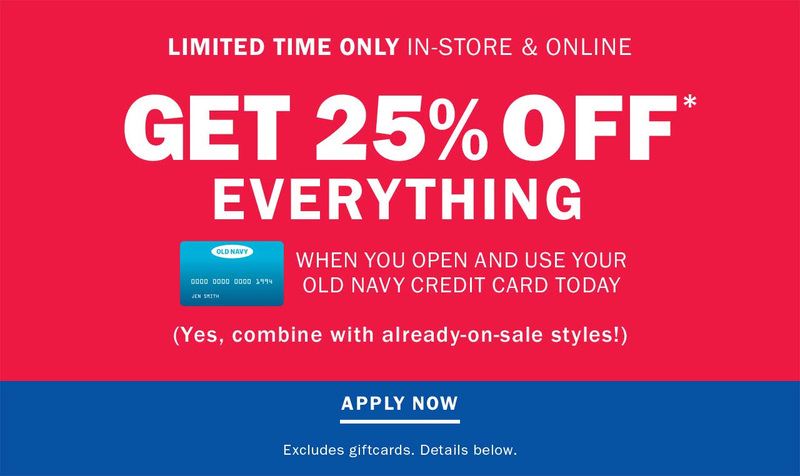 A new cardmember who opens an Old Navy credit card or Visa account in-store will receive a 25% discount valid for one time use in-store; discount taken at checkout. 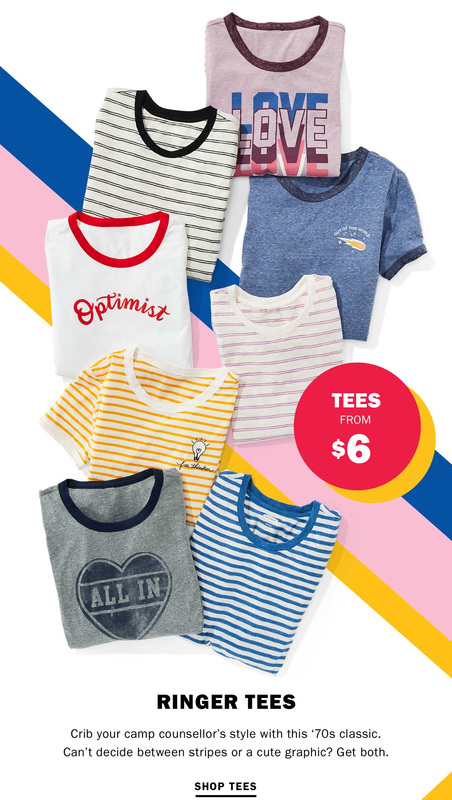 Discount not valid at other Gap Inc. brands or in our Clearance Center. Code expires at 11:59pm ET on September 3, 2018. Excludes giftcards, packaging, shipping & handling, and taxes. Only one first purchase discount per Account. Discount can be combined with only one other offer in a single transaction, except offer cannot be combined with employee discount. To redeem online, enter code at checkout. Discount value will be equally spread across all eligible items in the transaction. Not responsible for lost or stolen codes.